Education: Doing BA from Bombay University in Political Science and Economics. 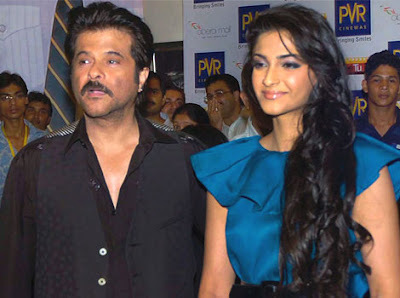 Sonam was born in Chembur, Bombay, India in the Kapoor family, which consists of Punjabi-speaking dad - Bollywood actor, Anil Kapoor, Sindhi-speaking mom, Sunita (nee Bhambhani), sister, Rhea and brother, Harshvardhan. She is the niece of film-maker Boney Kapoor, and actor, Sanjay Kapoor. The family has good connections within the Bombay-based Indian movie industry now popularly known as Bollywood. Boney's wife is noted yesteryear film actress Sridevi. Her cousin, Arjun, Boney's son, is an up and coming movie director. She completed her schooling from Arya Vidya Mandir and majored in Theater Arts and Chinese History from United World College of East Asia. She then also majored in Political Science and Economics from Bombay University. Her mom, who came from a business family, did not initially approve of her taking to acting and preferred that she get a college education, and then eventually marry and settle down. She assisted Sanjay Leela Bhansali during the filming of 'Black' and often went to Mumbai's notorious Chor Bazar near Grant Road Railway Station to shop for props. She has made her first appearance in Bollywood with 'Saawariya' opposite another débutante, Ranbir Kapoor, the son of Neetu Singh and Rishi Kapoor. None of her releases did well at the box-office save for 'I Hate Luv Storys', however, she was praised for her role in 'Saawariya' so much so that she was nominated for several awards, and did win the 'Stardust Award' for her performance in this flick. Even though 'Delhi 6' flopped at the box-office, her performance was praised. A person of varied interests she loves to read, write, paint, go shopping, and play video games, basket-ball and squash. she is also the brand ambassador of several popular brands, and is also proficient in Hindi, English and Punjabi. Sonam Kapoor is a newcomer to the Indian film industry. She was shot into fame after she signed her first film for a lead role with great Indian director Sanjay Leela Bhansali of Devdas and Hum Dil De Chuke Sanam fame. At present she is the most talked about newcomer in the Bollywood. Her uncles are producer Boney Kapoor of Mr. India fame and famous Hindi film actor Sanjay Kapoor. Sonam Kapoor is the eldest daughter and has one Sister Rhea and brother Harshwardhana. She can speak Hindi and English fluently beside that she knows Punjabi and Marathi too. She has been nicknamed as Giraffe by her father. Rani Mukherji is one of her best friends. Her early childhood passed in Mumbai and she started her schooling at Arya Vidya Mandir-Juhu, Mumbai. She did not carried the shy nature like her other fellow friends instead she use to play the game of basketball with her childhood friend Ranbir Kapoor in a local club.she joined Sanjay Leela Bhansali as an assistant for the making of the film Black and gained insight into the art of filmmaking. Sonam was overweight while she was assisting Sanjay Leela Bhansali but the genius of Bhansali spotted the fire and ambition of Sonam and offered her to play the lead role in his forthcoming venture Saanwariya. Sonam Kapoor took the challenge seriously and went for dieting and weight reduction under the expert supervision of her mother and Sanjay Leela Bhansali himself. She worked very hard to shed her extra fat to look fit for her role in the film and finally managed to loose 30 kgs from previous 90kg. After loosing those extra kilos Sonam looked like a statuesque beauty at 5' 9 ½. From the early childhood Sonam developed a knack of reading, she was so fond of reading that her librarian use to advise her to reduce her reading habit otherwise she would have to wear glasses. Maybe due to her habit of reading she developed the art of writing and she is a good writer. Simultaneously she developed the skill of painting too and developed it well. With many actors taking up the brush for social causes and whatever other reasons these days, Sonam too has the world as her canvas. Sonam Books: Milan Kundera's Unbearable Lightness of Being, Ayn Rand's Fountainhead and Atlas Shrugged, The Mahabharata because she finds it so positive and gives her hope all the time, 'Patrick Suskind''s Perfume, J.K. Rowling's Harry Potter series, Jane Austen's Pride and Prejudice and Sense and Sensibility, Chitra Banerjee Divakaruni's books including Mistress of Spices, Charlotte Brontë's Jane Eyre, and books by all the Bronte sisters. Declared Ranbir was unsexy, and that she had seen it all during the shooting of Saawariya when he dropped the towel for the infamous scene, and wasn't interested anymore. She also ridiculed his fashion sense. And let Deepika know that she found it admirable that Deepika held on to Kapoor for so long. Ending by saying that Ranbir badly needed a stylist and that he is a terrible boyfriend and he can never stay faithful. “I believe in the slogan ‘You are worth it’ and stand by it completely. Women should feel strong and empowered.They are worth it." Sonam Kapoor had started referring to Aishwarya Rai as Aunty because she had starred opposite her father Anil Kapoor. Sonam has no backtracked and claims she never said anything of that kind. The controversy had taken an ugly turn when Aishwarya had made sure that Sonam misses the red carpet during the Cannes Film Festival as the face of L'Oreal in India. Aishwarya had done this after Sonam Kapoor had commented that she was the young face of L'Oreal in India while Aishwarya Bachchan would appeal to the aged women. The former Miss World who has been the face of L'Oreal in India for a long time felt insulted by this. She retarrated by making sure that Sonam didn't walk the red carpet at Cannes with Penelope Cruz, Kerry Washington, Beyonce Knowles, Eva Longoria and Scarlett Johansson. Yes expect aish matter the aish i know is role model like her motherly deer woman hemamalini.aish is throughly pro still my love to sonam kapoor god has provision for everyone ,learn from aish ethics of acting or rather from ur father anil.mr india.